Our body for our robot, as mentioned in previous blog posts is going to be commercially printed, but before we can commercially print them we must know that our body is perfect so that we haven’t wasted a week waiting for a body that doesn’t even work. To test our body we have been printing out what we believe will work, finding any problems and then fixing them in Autodesk Inventor, then print and repeat. One major problem that we are having, however, is the size of the chassis. 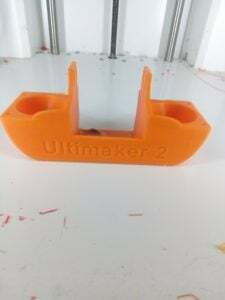 Thanks to the new cameras and UDOO X86 Ultra we have managed to cut down the size on the z-axis by quite a lot but because of the UDOO’s increased size lengthways, we have had to increase the size of the chassis slightly so that it can fit. Now the problem is that, now that the chassis is larger, the body only just fits on the build plate of the 3d printer we are using. 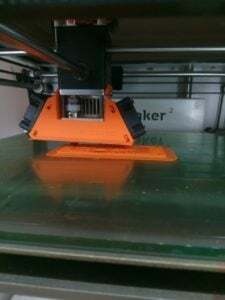 If we had been using an unmodified print head, we would be have been fine but seeing as we have a dual fan shroud on our printer it causes issues. 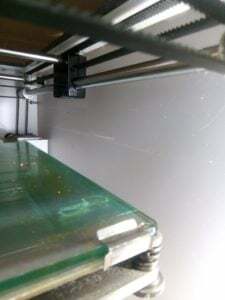 When the print head gets to the very right side of the print, the fan shroud presses up against the side wall of the printer which prevents the print head from printing in the far sides of where it needs to. The old dual fan shroud that was too large. This meant that when I printed the updated body, one of the side walls was only about 1mm thick when it was supposed to be around 3mm. To work around this I decided to just print a new fan shroud that was a bit smaller than the current one. I printed the fan shroud overnight, attached the fans and started the body but once again it was just the tiniest bit too big, even after I sanded down the right side of the fan shroud it was just a little too big to print the body accurately. The new current fan shroud, slightly smaller than the old one. Thankfully Mr. Stock came through with the save, modifying it so that it was just small enough to print. Although that print was not quite the body we needed, as the servos didn’t fit, it gave us a good idea of how all our sensors going to fit and what sensor holes needed to be modified.